Chittagong, Feb 27 (Just News): A factional clash foiled the council session of ruling Awami League’s student wing Bangladesh Chhatra League (BCL) north unit in the port city of Chittagong on Tuesday, injuring at least 13 activists of both groups. The clash erupted around 12:00 noon when the council session was in progress at Engineers’ Institution in Chittagong in presence of Awami League presidium member Mosharraf Hossain. 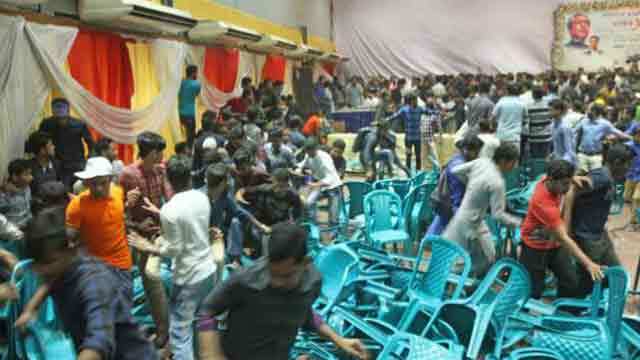 A cocktail went off in the council auditorium when a BCL vice-president was delivering his speech, triggering the clash between two rival groups of BCL, said Jashim Uddin, officer-in-charge of Chittagong city Kotwali police station. Additional police were deployed in the area to fend off any further unwanted situation, he added.